Martin Guptill's century helped New Zealand A avenge Saturday's defeat by Ireland as they earned an 111-run win in Monday's game in Dubai. 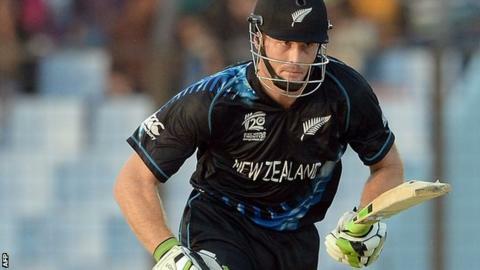 Guptill's 129 included five sixes and nine fours as they ran up an imposing 337 in 49.5 overs. In Ireland's reply, skipper William Porterfield hit 63 with John Mooney unbeaten on 49 as they were bowled out for 226 in 40.5 overs. Andrew Balbirnie's century helped the Irish win by four wickets on Saturday. Balbirnie hit 36 on Monday as he Porterfield put on 81 for the third wicket after opener Paul Stirling had departed for a duck and Niall O'Brien only managed 11. However, Porterfield and Balbirnie then departed in quick succession as the Irish stumbled to 124-5. Mooney and Gary Wilson put on 73 in 75 balls for the sixth wicket before Wilson exited for 41 after attempting to hook the impressive Adam Milne. That sparked a late order collapse, Milne picking up 5-33 as Ireland were dismissed with Mooney left stranded on 49 from 52 balls, which included five fours and a six. Earlier, Guptill shared an opening stand of 138 with Dean Brownlie (66) to give their side a solid platform. Guptill has played 87 one-day internationals for New Zealand and also made 31 Test appearances. Stuart Thompson (3-47) and Peter Chase (3-38) brought Ireland back into contention, but a late assault from Kyle Mills (36) and Nathan McCullum (31) added 66 in 34 balls to take the match out of Ireland's reach. The Ireland selectors will pick their World Cup squad next week for the competition which starts next February in Australia and New Zealand. Ireland will play warm-up matches against Scotland and Bangladesh in Sydney on 10 and 12 February.